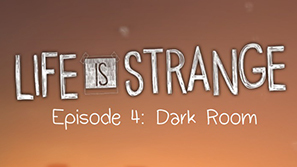 This is the episode of Life is Strange we have been waiting for. In Dark Room, many questions are answered and part of the mystery is solved. These revelations are shocking, grim and will leave you wanting more immediately. 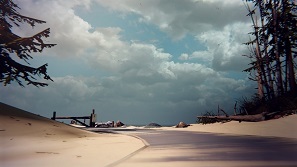 The episode begins where the last finished; a scenario that is difficult to discuss in a review without spoiling anything. 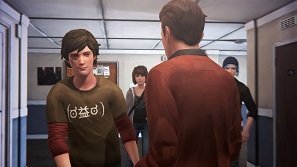 The opening scene is touching and is another example of the strength of Max and Chloe's relationship. Moral questions are asked of the player as well. The initial major choice is a gut-wrenching one, even though you know it will ultimately be inconsequential due to Max's time travelling abilities. 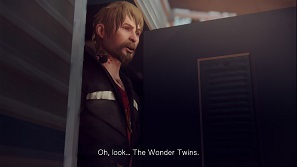 I would have liked to have spent more time exploring this scenario and the implications it had on Arcadia Bay and Max's life, but it is understandable why Max would want a swift resolution. Finding evidence, puzzle pieces and clues is the main objective of Dark Room. 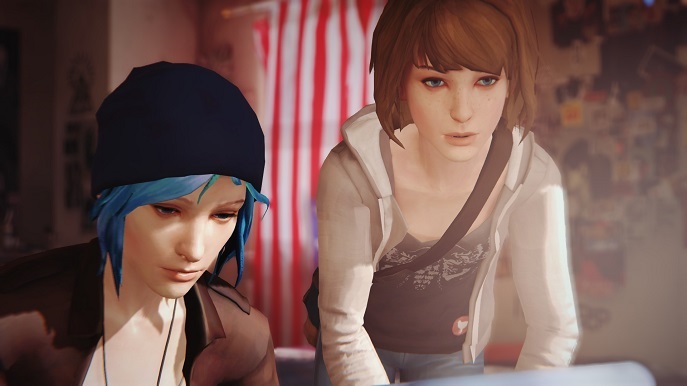 Time is running out and Max and Chloe need to solve the mystery with haste. Nathan is becoming more and more out of control and his part in the mystery requires exposing. This takes you to various locations in which you'll have to find the right items and the correct route through conversations with unsavoury characters. These scenes have been tightened since earlier episodes. I knew what I needed to find and found them with ease. 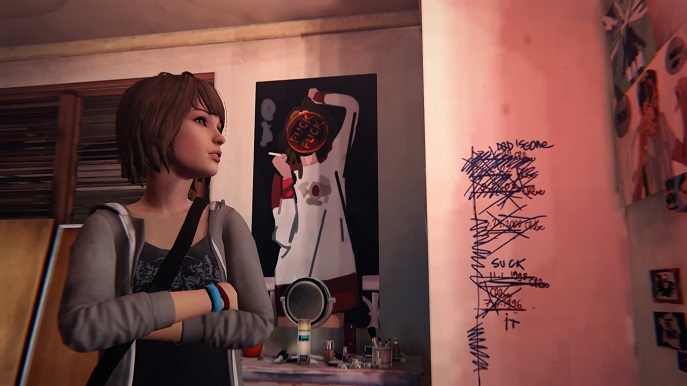 A highlight of the puzzles so far in Life is Strange comes when you have collected all of your evidence. You see them all spread out across a board and need to connect the correct pieces to find answers. It initially appears daunting, but thinking about it logically brings a swift solution. Looking at the times, dates, locations and people that all the evidence refers to and connecting them to reveal what may have happened is satisfying. This is where the narrative really takes centre-stage. Dark Room descends into a grim and unpleasant tale, even more so than events in previous episodes. I progressed with baited breath with an idea of what may unfold; it turned out I was correct with some aspects of it though the game still held surprises. The initial discovery is only the start of a sequence that is an excellent example of narrative in games. There was a scene where the camera zooms out and fades to black. I was fully expecting the credits to roll but there were another two scenes afterwords. This episode is considerably longer than any that came before it; by about forty-five minutes. The very end of the episode is a shocking unveil that will leave you wishing for the final episode now. Many questions are answered, but more questions arise from the outcome. 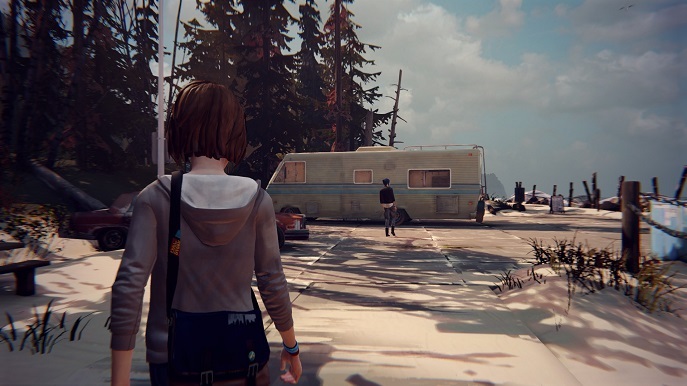 I feel my play-through of Life is Strange has used all of the worst outcomes from the available decisions and I'm interested in how this episode pans out for people who have had happier resolutions. The first episode released at the start of February; we've been getting to know these characters for nearly six months now. Every harmful thing that happens to them hit harder on the player now and Dontnod are using this to their full advantage. The episode still continues the series' excellent cinematography and soundtrack as well as some of its faults; I still wish the characters would emote more. Their faces often don't match the state of emotion the scene dictates. The quality of dialogue has improved considerably since Chrysalis, mainly because of the more serious undertones of the situation. Many side-characters are no longer the one-dimensional stereotypes they were in the first episode. They've grown, becoming people with the capacity for more than one emotion. Dark Room starts off slowly but the second half is a series high. The discoveries are distressing, grim and desperate but will keep you hooked through to its shocking outcome. The wait for episode five is going to be a long one and I cannot wait to see how this series concludes.